Mobile devices have become an integral part of our lives, however, most of us have little idea how often and how long we are spending with these devices. 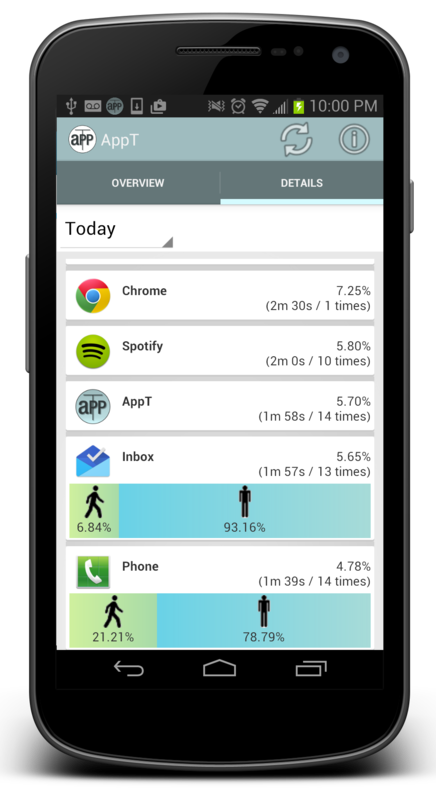 Track your mobile phone habit by installing Application Time (AppT) today! Mobile devices have become an integral part of many of our lives, so much so that recent studies have found severe separation anxiety between people and their mobile phones, with participants citing the apprehension of missed communication with friends or loved ones without access to chat or social media applications. Motivated by this as well as anecdotal evidence of the large effect of mobile devices on our lives, we at the Northwestern Aqualab are embarking on a study to collect and analyze the usage patterns and habits of the population. Today, we are releasing our mobile application to help users track, analyze and understand their relationship with their mobile device. 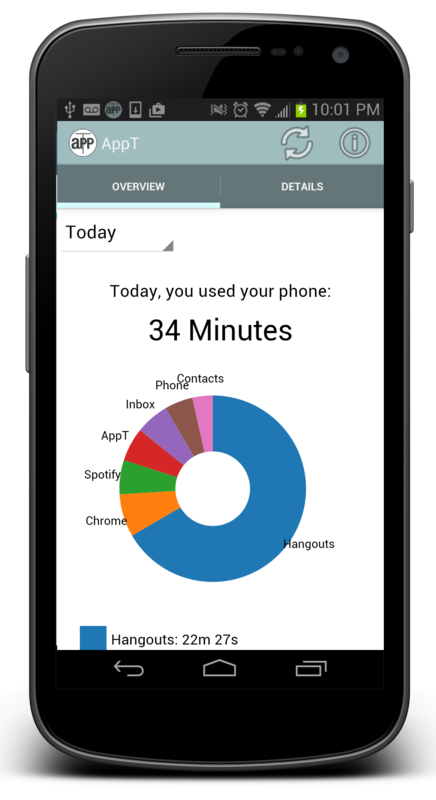 Named Application Time – or AppT for short – the app allows users to track and visualize their usage of mobile applications and the frequency and duration of their mobile device interactions. The application is now released to the Android Store for download – a more detailed description of the measurements and mechanic, refer to the project page on our website (appt.aqualab.cs.northwestern.edu). The screen shots below show how the app allows users to visualize aggregated and individual usage of applications on their device through an easy, intuitive interface. The app also allows users to export their usage data so they can perform their own analytics if they desire. We have been using AppT for over a year now internally in out lab. To illustrate some of the awareness and insights that this can bring, I present an analysis of my own mobile device usage. The first interesting thing we found was the long tail of application usage, and that the top 10 apps account for over 90% of the device time, and that the other 30 or so apps only account for the remaining 10%. These top apps (shown in Table 1) include common communication related tasks such as calls, SMS and email. It was surprising to see Google Hangouts – a SMS and chat client – was used over 11,000 times over the course of a year; that amounts to just over 23 times a day on average. 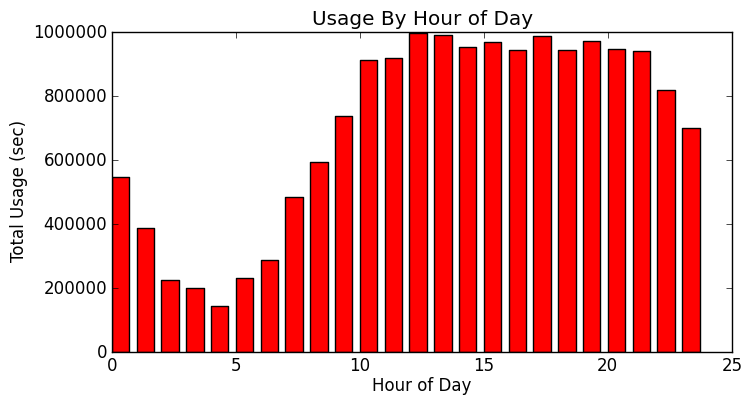 Looking at temporal usage patterns, a couple of interesting items can be seen. 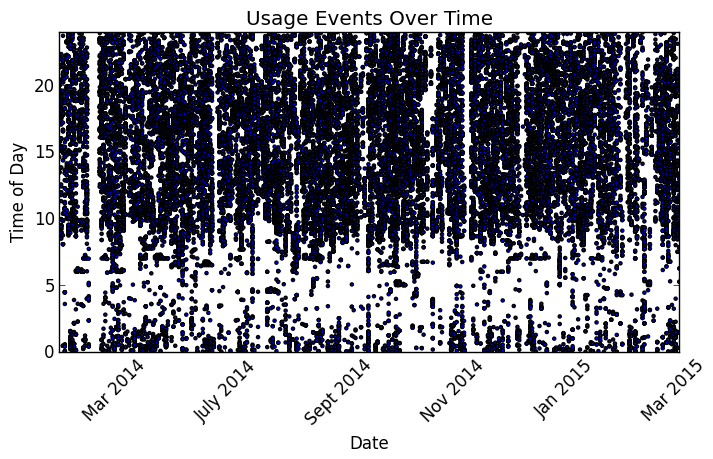 In the figure below, each dot represents an instance when a mobile application was launched. Besides the overall amount consistent quantity of usage, we see that in general the phone is the first item checked every morning, and is consistently accessed throughout each day and into the early morning. One point of concern was the peak in usage each day during the middle of the work day in the late afternoon. It was noticed that the device was primarily being used for chat and email messaging even though the user was sitting in front of a computer. This meant that work is being consistently interrupted to check each and every notification on the device, regardless of the notification’s urgency. Such a constant distraction can be very detrimental to long period of focused effort. Once aware of this activity, the user now disables all notifications throughout periods of concentrated work (using several of the apps available), and has seen great improvements in productivity. 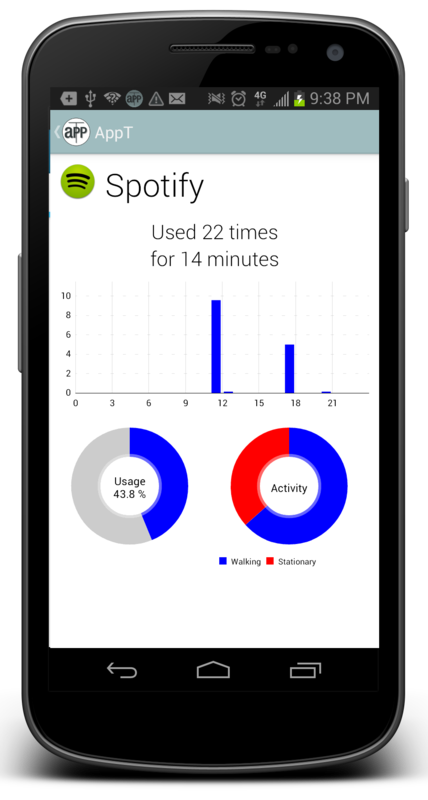 Our lab has released the app Application Time to the public on the Google Play Store so others can collect and analyze their mobile device usage. Hopefully, by using AppT you will be able to figure out ways your own ways to break dependence, improve productivity, or be aware of your device habits.